At the end of the '30s, World War II broke out. In a still neutral Italy (it would enter the war in 1940), the comedy of the absurd was a way of unconsciously rejecting the seriousness of what was happening in Europe. 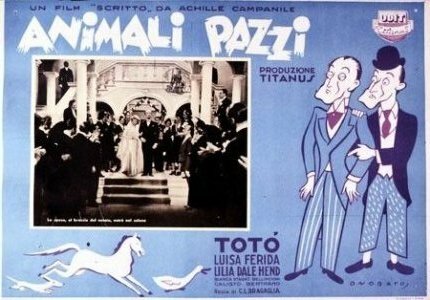 In 1939, ANIMALI PAZZI [CRAZY ANIMALS] appeared, directed by Carlo Ludovico Bragaglia (born in 1894) on a story by Achille Campanile, in which a Neapolitan music-hall comedian, Toto, scored a hit with his puppet-like, wholly unrealistic acting, in the part of an aristocrat forced to get married in order to come into an inheritance. Another film, IMPUTATO, ALZATEVI! [DEFENDANT, STAND UP! ], by Mario Mattoli, also appeared, with a script written by the director himself together with one of the most popular contributors to the comic weeklies, Vittorio Metz. The star of the film was another comedian of regional and dialectal origin, Turin-born Erminio Marcario (1920-1980), with a round, innocent, Harry Langdon-like face. At that time he was the most popular star of the music-hall, which he carried to the heights of Parisian elegance, with lavish choreography, a chorus-line of beautiful girls (known on the bills as "Macario's Little Women"), spectacular scenery. Macario was, like Langdon, the innocent who wasn't even capable of realizing the enormous predicaments he kept getting into, the catastrophes he brought about; into the character he introduced a highly personal note of romantic delicacy. IMPUTATO ALZATEVI! [DEFENDANT, STAND UP!] was a take-off on thrillers and trial films, with an attack on the judicial system that was so pungent that, aside from setting the film in France, the producers decided to take precautions and insert this hypocritical statement at the end of the credit titles: "Everything that happens in this film is purely imaginary and seeks to be nothing but the caricature of events and institutions fortunately far removed from our climes".